Single family in North Scottsdale with huge lot, private pool and spa! 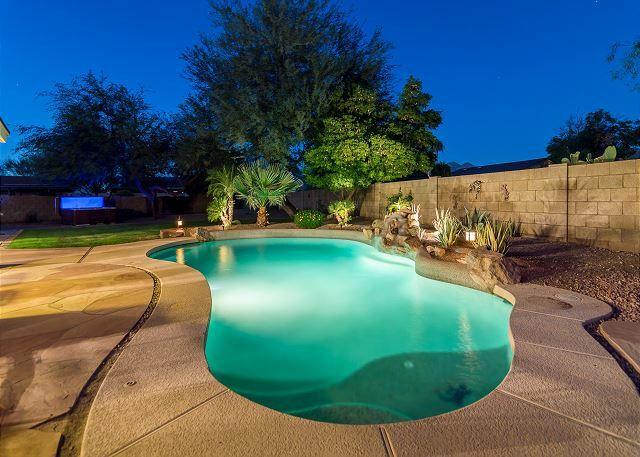 Casa Willow is located in a mature neighborhood of North Scottsdale, convenient to all the culture and natural beauty the Valley has to offer; as well as just a few minutes to the Mayo Clinic. This quaint residence boasts a large lot with plenty of play room in the fully loaded backyard. Guests will enjoy the private pool, separate 8 person above-ground hot tub, built-in BBQ grill area for cooking, outdoor pool table, and enough lounge areas to accommodate the entire party. Upon entering the home, the main living area invites you in with comfortable leather seating, 67” TV, and Blue Ray/DVD player to enjoy a theater-style movie night. The authentic rustic French doors make the outdoor pool table accessible from the living room. The spacious kitchen boasts granite countertops, and opens to a large eat-in dining area. The home offers 4 bedrooms and 2 baths, comfortably accommodating 8 guests. The master suite with king-sized bed and 55" TV opens to the backyard and has an en-suite bathroom, complete with granite countertops and over-sized walk-in shower. The second bedroom contains a queen bed, small office desk with internet, and a 32” wall-mounted Plasma TV. The third bedroom also features a queen-sized bed and walk in closet, and the fourth bedroom has two twin beds. Each bedroom has hard wood floors, and the shared bathroom has granite countertops and travertine shower/tub. This home is the perfect playground for your next trip to Scottsdale! *Please note the pool is not able to be heated, but you can use the inviting outdoor heated spa at your leisure. ***Pets allowed with prior approval only. we were very pleased with the house we rented.